There is an irresistible, Herzogian flavor to Kevin Macdonald’s new documentary, “Sky Ladder: The Art of Cai Guo-Qiang.” It celebrates the art and ambition of a Guo-Qiang, who paints images in the sky using colorful fireworks. Along with telling his story of artistic success, Macdonald’s film specifically documents Guo-Qiang as he tries to create his most demanding project yet, the sky ladder—a firework display that would ascend 1,650 feet into the air. “Why can’t I be Picasso?” he asks, matter-of-factly. In “Sky Ladder,” the firework proves a fascinating instrument to achieve such heights of genius—one used to create a moment, painting the sky with calculated explosions and bright colors, creating clouds of distinct beauty. In various displays and montages, it feels like Macdonald is able to capture the in-person experience of Guo-Qiang’s art. Using a great amount of footage from his displays and sequences captured in part by legendary cinematographer Robert Yeoman (a frequent collaborator with Wes Anderson), Macdonald utilizes wide shots and select close-ups to provide great detail, giving us a special look that instantly make this Netflix title worth watching on the best screen possible. The sound design of pops and sparks further illiustrates how an array of explosions can lead to something beyond words. A portrait of a fascinating artist and his unique art, Guo-Qiang proves to be a potent subject himself, his life narrative an interesting reflection of what creates an artist. With select footage of talking head interviews with his family and those who work for him, Macdonald shows how where we come from is incredibly influential on our expressiveness, especially regarding what and how we want to say something. Guo-Qiang was raised in Zhangou, an originating Chinese town of fireworks, where he honed his voice for art and expressive explosions. His father was an artistic calligrapher, who created and images in single instructive strokes, a type of formalism that was antagonized by China’s cultural revolution, but continued by his son decades later in city harbors with calculated clouds of smoke. 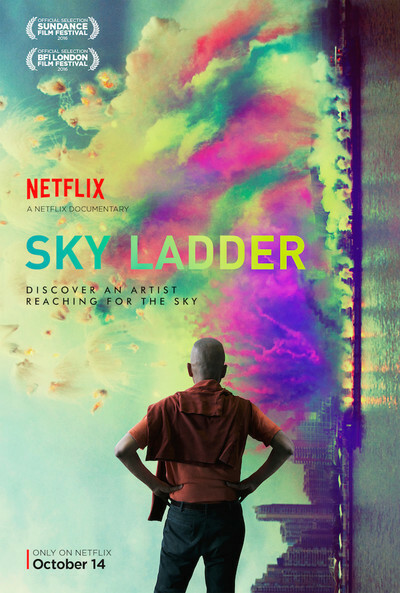 As “Sky Ladder” chronicles the international success of Guo-Qiang, how he went from controlled explosions on canvasses (using smoke as the paint) to becoming an international, Damien Hirst-like brand, the film parallels with the question of art’s commodification and the limits of integrity. Guo-Qiang’s motivation to reinvent the possibility of the firework is challenged by those with smaller imaginations—those who want to use his bright, intricate images for mere entertainment, or censor it, like when he’s commissioned to do a display for China’s APEC economic leaders conference in 2014. A central moment with him “collaborating” with government officials is painful. In a rare instance where Macdonald takes a more critical stance to a subject he is clearly a huge fan of, Guo-Qiang lists other artists who do similar gigs, and claims there is a bias against him because it’s China. The sequence is an emotional roller coaster, and with the deep understanding Macdonald’s film provides us of Guo-Qiang’s unique art, the resulting fireworks display, lacking color or heart, is understood to be a tragedy. This chapter is one of many interesting ideas that collectively make “Sky Ladder” an often fascinating documentary, even if its focus doesn’t successfully combine biographical details with the title piece pursuit (the film can seem unfocused when it’s more likely poorly self-advertised). In the end, it is Macdonald’s artistry that matters most: He has not made a tribute but an extension of Guo-Qiang’s art, while utilizing the power of the documentary. In 80 minutes, “Sky Ladder” teaches you through sight, sound and dialogue about a new artistic language, while making you an expert on one of its masters. For all of the film's ideas of art and entertainment, it might just forever change your preconceptions of the firework.